Even in summer, I love sleeping late. My aversion to getting up in the morning is much greater in the winter, when the cold weather makes a snug warm bed all the more appealing. Despite this, I’m learning to appreciate rising early, even when I don’t enjoy it. While winter brings a lazy streak, it also sparks my inner drive to get organized, set goals and form good habits. Those winter resolutions, along with the beauty of the snowfalls such as the one I’m seeing right now, are reasons why I love winter despite the discomfort and inconvenience of inclement weather. I hope you are enjoying January too, whatever kinds of weather it brings to where you are. If you are in the midst of your summer, or live in a tropical climate, enjoy it! Sip an iced tea for me, and go barefoot in the sand of a seashore whenever you have the chance. If you, like me, are in “cozy hibernation” mode, keep that kettle on and lots of tea, coffee or cocoa handy. Check out some of the many self-improvement articles that proliferate in January via magazines and websites, and dream of springtime. As I keep reminding myself, it will be here before we know it! One practice that I can only enjoy at this time of year is to light candles (many candles) to form an island of light in the dark and cold, and then enter into that Island of light to read my Bible and have communion with my Lord, with soft music playing in the background. Sort of like a “date” with God. I’ve tried to re-create that experience in summer, but the light from outdoors removes that ambiance of mystery, the demarcation of Holy space, and the summertime noises from children playing and lawnmowers being run distract from the quiet focus that I find in the winter. In summer, if I wait for the sun to go down, I’m too tired to meditate as clearly. Susan, I too use candles mostly in winter, because when I used to light a lot of them at bath time, I found that they actually create a lot of heat. I do find the sight of them mesmerizing, not as much so as a fireplace with a big roaring (real, not gas) fire, but the same appeal. I don’t generally use candles at prayer time but I can certainly see that they would be conducive to a devotional mood. Cherie, if even Florida is getting cool weather, I guess I shouldn’t complain. I hope it’s not cold enough to endanger the citrus crops! We are all OK, hope you are too. Keeping you and Ron in my prayers. Bundle up and enjoy the first warm day extra for me! Upon reading your thoughts, I nixed the coffee and poured hot chicken soup in my mug! Thanks for the great thoughts! Steve, I should have fixed myself some soup today. Maybe I’ll try that tomorrow. I love soup, but don’t fix it at home that much because Jeff and Matt prefer “real” food. But I never tire of soup, and order it often when we eat out. They say chicken soup actually helps keep away the colds, too. Hope you are doing well and enjoying 2015! Thanks for being here. Hi Julia, in the Blue Mountains, NSW where we’re enjoying ? humid days of around 33degrees maximum and 18degrees minimum, so I really enjoyed seeing your snowy picture this morning. I rise early to walk in the bush before it is too hot. The mornings are beautiful here, quiet and coolish. The heat is not too bad but the humidity is hard to put up with, however, it means there is less chance of fires in our area as often we have thunder storms briefly in the afternoon. Enjoy your winter days and comforting hot drinks. Dorothy. Sheila, I’m so happy you are able to be at home, snug and warm. I love being at home, though I always enjoyed working too. I’m glad to have had some of both to enjoy over the years. You are fortunate that Bill can keep you posted on everyone. I still wonder and think fondly about some of the customers I knew at the bank 35 years ago. I’m actually getting up early (6 am) every day now, even when I don’t have to. (Matt’s program has had two-hour delays all week due to the weather, so I could be sleeping in as he does, but I haven’t been.) So I can’t claim to be hibernating, as much as I love to do that, except in the sense that I’m staying indoors much more than usual. But Saturday is STILL major hibernation day for me! 😀 I usually sleep until 8 or 9 then. You are a warm spot in my thoughts too! We have been very disciplined with the cookies you sent, so we still have a few to enjoy, and both Jeff and I munched on some tonight. They are so well packed that they have stayed quite fresh. I need to send you a photo of the butterflies on our Christmas tree! Hope you have a great weekend. Good Friday morning…. COLD, I might add. ☕️ I’m so glad to read of how you’re spending your days, hopefully able to take your daily walks soon. I suppose Eric enjoys the insight, too. 😉 Have a very good weekend! ⛺️Too cold for Willow Tree. Hi Sheila, good morning this Saturday noon! It’s a bit warmer here, and sunny, but the chilly feeling lingers and I’m about to brew up another cuppa. I too hope to return to an outdoor walk; in fact, I might be able to squeeze one in today, with a bit of luck. I was afraid it would be too cold for Willow Tree this weekend. I’m sure Walter is glad for your company. Hi Eric, I don’t think Sheila will mind. Your comment about Sheila (and Larry too) has pointed out what I said to Jeff just last night: many of my online friends have actually been in touch with me more often over the past two years than anyone among my close friends and family. I really do appreciate it. It gives me a feeling of being surrounded with people’s concern and support. This is not to downplay the love of those who are not in frequent contact; it’s only to say that those who have the gift of enjoying written communication enough to make time for it regularly, are giving of themselves as surely as those who engage in other pursuits that might seem to some more practical or urgent. Those gifts have been like stepping stones on which I have navigated some pretty rough whitewater the past two years, one stone at a time. Thanks to all who have given me these firm footholds over the past two years!! Sheila, That all sounds great (as it should be). Some have thought of aircraft commanders (military term for the civilian role of “captain”) as ego-maniacs. And, to be fair, a very few actually are. But like you speak of Bill’s transistion; those long-time captains who have literally “taken a back seat” to younger crew members prove their true professionalism by never having a chip on their shoulder, and continuing to perform their duties with efficiency and respect for “the new boss”. I really miss Larry’s comments, too. I remember that he was enjoying Julia’s blog and sharing as he read to Jeff’s mom. I’m so glad for his presence here, although too short! Sheila, I know Jeff’s mother really misses her morning time with Larry. Each morning before he went to work, he would sit down with her at the computer (she didn’t have one and feels she could never learn to use one) and they’d have coffee and read the blog. She said they would always read each and every comment, and if they missed a day here and there, they always went back and caught up. I am sad knowing she doesn’t get to read the blog anymore. Larry was such a kind and giving person. Anytime anyone needed anything, he was there. I too am glad for the time I was able to be in contact with him here and via email. I used to send him some of Jeff’s test results, which he would discuss with the radiologists he worked with at the hospital. No matter how bad the news was, Larry always remained stubbornly positive. Their daughter is a cancer survivor, so he’s been there, though hers was not as advanced as Jeff’s. K, I’m so sorry you have a cold! That can be such a nagging kind of misery. I hope you get plenty of rest and nice hot liquids. I love the idea of your Valentine’s display. It’s wonderful that you have a job where you can put your amazing creativity to good use. BTW speaking of that, thanks so much for sending me the sweet video of P&B! I love kitties. I still haven’t been able to figure out how to get my FB videos to work. I tried turning off Ad blocker for Facebook but that didn’t help. When I get time I will do what Alys suggested and uninstall/reinstall with different parameters. 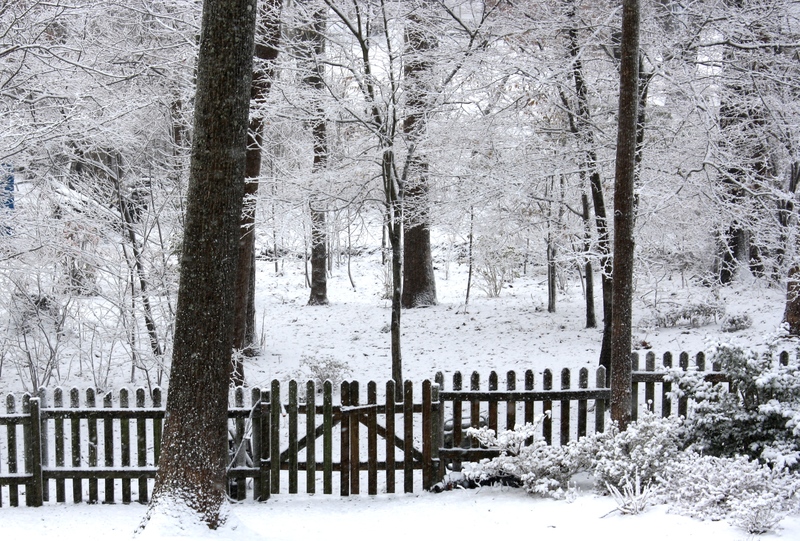 You are right, winter always looks prettier in someone else’s yard…and I might add, in photos too. I think it’s partly the idea of seeing it free from all the attendant chores one sees when looking out “in real life,” but it has to be more than that. When I was a little girl it used to amaze me how looking into the mirror, I seemed to see an intriguing world in there that was just like the room I was in, only different enough to seem enchanted. I used to wish I could go through the mirror like Alice, and explore what lay just beyond that doorway so like my own. Maybe it’s sort of that same thing when one sees a photo. I guess that’s partly why I like photography. When we freeze and isolate moments, they become prettier somehow. Eric, we got about 4 inches on Tuesday. Then the temperature dropped, so much of it remains, except was was shoveled,melted, rusted or salted off of the streets and pavement. I’ve been an organizing fiend this week. Funny you should mention that. I’ve been through kitchen drawers, my coat closet and the linen closet in our hallway. It started with the “putting away of Christmas” and continued from there. Even with a nasty head cold I felt spurred to complete something. My son ‘caught the bug’ and while I was out for the evening with my book club, came close to emptying half his room. That photo from 2010 is indeed enchanting! I love a good snowfall, especially when I can enjoy precious moments with a warm cup just looking out upon the beauty. Lovely talking with you last evening! Thanks, LB! I hope you will soon see how that same scene looks in the spring. 😀 Fun in store! It was 58 degrees here today and I had to go out and wash the car. I can hear the grass growing. And the mountain was out. They say it is the El Nino thing again. Does not seem right when so many are freezing on the East coast. Two years ago on January 18th I was supposed to fly to Nashville. They had a freezing rain and even the taxis stopped running. The planes ran out of deicer and I did not make it out of Seattle. Spend the day at the airport. So anything goes here. Michael, enjoy that 58 degree weather on behalf of the east coast. Today was cold here in Virginia, but sunny, so I enjoyed my walk. It’s amazing how much the sunshine can make the cold seem bearable. Having said that, I am referring to the high forties as “cold” so it’s all relative. I imagine they don’t have to keep a lot of de-icer around in Seattle most of the time. It would be interesting to see decades of statistics on how much of that was used systemwide, average per takeoff, as a measure of how much climate change has affected flights over the past couple of decades. Of course, the products they use now might be different, so I suppose a true comparison isn’t really possible.